Assuming that you took the advice in section 1 and you have a very slow plane that’s not going to smithereen itself in the event of a minor mishap, let’s move on to section 2 where I share what I think is the best way to learn how to have an enjoyable outing and come home with an intact airplane. It’s not an easy proposition, because you need skills to avoid crashing, but you need the plane not to crash so you can gain the skills. The first thing you need to know about flying is that you always take off and land with the plane facing into the wind. Don’t ever be tempted to do a downwind takeoff or landing, unless you want more practice on the building board. This is the most important thing. Now that it’s out of the way, we can move on and learn the rest of the stuff you need to know about flying. The first item on the agenda is flight trimming your airplane. This is tough for a beginner. You need to learn to fly, and you need to be able to trust that the plane itself doesn’t have a problem. If you can, get a competent pilot to fly and trim your plane before you start. Now if you don’t have a flight instructor at least you’ll know the plane won’t just roll over and crash as soon as it takes off. If you do not have anybody who can at least test fly the plane, you’ll have to do it yourself. With the radio turned on but not the motor, stand on the downwind end of your runway and hand-launch your plane into the wind to see if it glides in a straight line. Correct a turning path by adjusting the trim tab on the aileron or rudder stick until it flies straight. You also don’t want it to porpoise or dump itself immediately to the ground. Assuming that the center of gravity is correct, porpoising is caused by excessively high elevator trim, whereas a non-gliding path that just plops to the ground is caused by excessively low elevator trim. After you assure yourself that your plane is well trimmed based on its unpowered glide performance, your next step is to fly it for real. When you attempt powered flight your biggest problem is going to be reversal syndrome. If you don’t know what that is, consider that when you push the stick to the left, the plane turns to the left, but when the plane turns around to face you and you push the stick to the left, the plane turns to your right, because that’s where the plane’s left is now. You have to get used to this because your natural reaction is to keep pushing the plane to the left because it’s going to your right, and you’ll cause it to enter a spiral dive to the plane’s left, terminating at the ground. Your number one priority is to overcome reversal syndrome before it causes a crash. If your plane and flying field are suited for it, taxiing is good practice. Just taxi around until turning the correct direction comes naturally. You can also use an RC car to gain this reflex, or of course an RC flight simulator on your computer. If you simply don’t have room or you don’t have landing gear, or whatever, and you have to fly instead of taxiing, then we’ll have to move on to the next step and learn to fly. My flight training plan starts with the simple back-and-forth exercise. Fly the plane directly away from yourself in a straight line until it’s a fair distance away but not getting out of sight. Then turn it 180 degrees until it’s flying directly towards you, and fly in a straight line until it’s right in front of you. Then turn 180 degrees again and fly directly away from yourself again. Repeat this until your brain is full, then land the plane and take a rest. There are two good reasons to do this exercise. One is that straight lines minimize the confusion that arises when you cross over from normal to reversed controls. When you fly in circles, reversing your controls in your brain happens at weird and unpredictable times. My method makes the control reversal point very predictable. The other, and probably more important, reason is that your goal is to learn to fly the airplane rather than simply react to it. 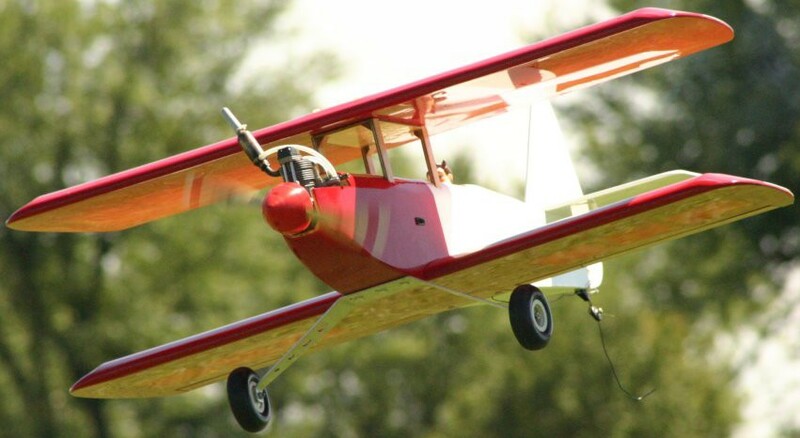 Most new RC pilots chase their planes around the sky, even if they don’t know that’s what they are doing. The plane drifts to the left…. oh, let’s fly over here for a while. Then it comes back…. well, I could fly behind my head I guess. That’s how I used to fly, and I didn’t get over it until I started teaching others. If you’re teaching yourself you need skills as soon as you can get them, so stick to your flight plan and make the plane do what you tell it to do. This is probably the most important piece of advice you will ever receive as an RC pilot. I could go on all day making this point, but I like to keep these articles short and concise, so just remember how important it is to be the plane’s pilot instead of just chasing it around. Make a plan, and make it happen. The other major hazard to the new pilot is landing. Every flight has to end, and landing is the most dangerous maneuver, so you’d better start paying attention. You’ll hear a lot of nonsense about landing, and everybody seems to have opinions. In my home town the local RC guru was a retired B-52 pilot. A lot of military planes land with power on in case they encounter a need to abort. Predictably, everybody who learned from our local B-52 pilot would land their trainers (and everything else) with significant engine power and the nose super high, on the verge of a power-on stall. It was weird. My preference is to watch Cessnas landing at a small airstrip and do what they do. The typical procedure at the end of a flight is to cut the power to about 1/4, trim the elevator up to hold a slight nose-down attitude without picking up speed, and let the plane sink toward the runway. When it’s getting close, power is cut to idle (or off, with an electric motor) and the elevator is used to arrest speed. When the ground is getting close, the elevator is pulled up to flare and stall, and the plane should touch gently. Note that up elevator is always used to reduce speed, until it finally causes a stall. The trick is to not use too much up elevator and stall early. If your engine dies, remember that you can’t keep the plane up in the air with up elevator. Let it come down in a short path to the runway, but don’t try to hold it up or you’ll stall it far away. For the beginner, this can be integrated into the back-and-forth basic flight training pattern that I just told you about. Identify your runway and stand at one end of it. Launch the plane and fly away from and toward yourself until you’ve had enough. Then land your plane on one of the “away” passes. If you have people around you telling you not to stand at the end of the landing area, congratulations. It means that you have somebody to teach you to fly. Otherwise, it should be no problem to stand wherever you want. Step by step, here’s how you set up your landing. With your plane at a safe altitude, go to moderately low power and see what happens. The nose will drop, causing acceleration. When you’re landing you don’t want acceleration, so you have to adjust the elevator trim tab to keep the plane from picking up speed. Notice that the plane still loses altitude, but it doesn’t dive nose-down. This is important to remember, as it demonstrates that contrary to first impressions, the power setting is related to altitude and the elevator is related to speed. If you dial in too much up-trim you will lose too much speed and cause a stall. Get this all taken care of at a safe altitude, and then when you’re ready to land you’ll know where to put the throttle stick and where to put the elevator trim tab. Now that you know what to do, and you’re really ready to land, cut the power, which will cause a loss of altitude. Trim the elevator up and the plane should descend gently. If you find that you are too high and the plane is going to run out of runway, power it up and go back to flying the same training pattern. When you come around again, try it again farther back until you think you have it right. When it gets several wingspans from the ground, go to zero power or idle, and gradually increase the up elevator until it’s about 1/2 to 1 wingspan from the ground. At this point, ease your way to full up until the plane flares and stalls. The goal is to time the stall so it happens when the wheels touch. This is what I consider the essential basics of RC flying. Don’t fool with anything else until you can get your plane up, fly it 360 degrees without getting confused, and get it back down. Then we’ll move on to basic non-stunt maneuvers and what they’re supposed to look like.